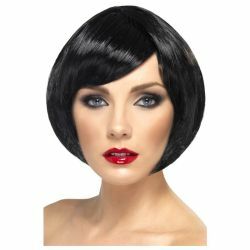 Short bob wig with fringe bangs. Perfect for 1920's flapper wigs, Go-Go girls, and mod wigs. Available in black, blonde, or brown. The wig features an elastic band for a comfortable and secure fit to almost any head size.